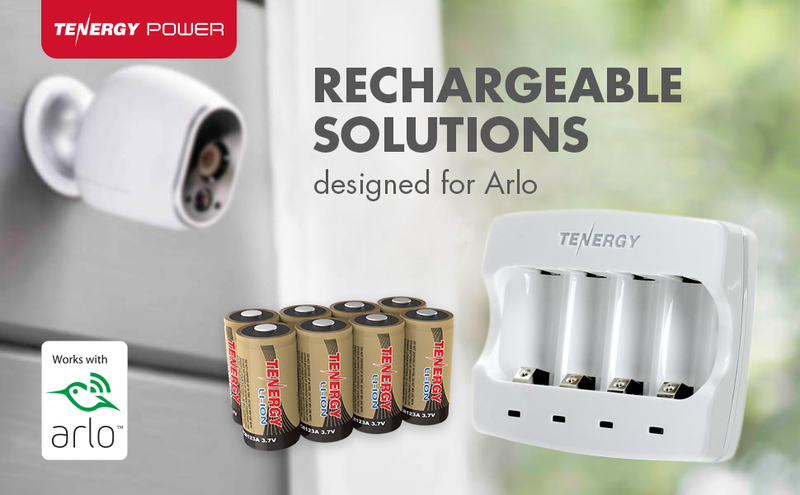 ARLO CERTIFIED – Save with Arlo Tenergy Rechargeable Batteries and Charger Combo Kit. WHY RECHARGEABLE – Arlo certified, recharges 500 times, saves money long term, environmentally friendly, saves time by having to buy less, longer run time, less initial investment. SMART PROTECTION – Built-in protection circuit actively detects common errors to protect the battery and charger. GUIDE FOR INSERTING BATTERIES – 1. Check the battery orientation shown on the battery compartment. 2. Insert batteries accordingly. Advanced Sophisticated Charging Safety: Advanced, built-in protection against reverse-polarity, overheating, and short-circuit to ensure total charging safety. Also features safety timer which will automatically shut off the charger in 3 hours to prevent over-charge and gives you a peace of mind. Smart Battery Protection: Built-in protection circuit actively managing battery performance during charging and discharging. Helps prevent over-charge, over-discharge, short-circuit, or overcurrent, by shutting off the device to protect the battery and charger. Provide superior safety performance than batteries without protection. 4 Independent Charging Channels With Status Indicator: Charges up to 4 rechargeable batteries in independent charging channels with LED indicator lights to display status and notify you when they are ready. Fast Charging: With charging current of 400mA, your batteries can be fully charged in about 2-3 hours. Certified for international CE and FCC safety standards. It has also been certified to California’s CEC standard to ensure power efficiency. Charger Adapter with UL certification. Recharge ONLY Tenergy Li-ion 3.7V 650mAh RCR123A batteries. Other rechargeable RCR123A batteries do not work with this charger. DO NOT mix & use this Tenergy Li-ion 3.7V 650mA rechargeable RCR23A battery with any other rechargeable RCR123A batteries. This Tenergy Li-ion rechargeable RCR123A battery is intended for use in security cameras only. Do NOT use the batteries in any flashlights or any device that requires high power or high current drain. Do NOT mix this Tenergy Li-ion 3.7V 650mAh rechargeable RCR123A with other batteries (For example: Panasonic or Duracell Lithium CR123A). Do NOT mix/use this Tenergy Li-ion 3.7V 650mAh rechargeable RCR123A battery with any other rechargeable RCR123A batteries. Misuse of either charger or the batteries could cause explosion or fire.